Congratulations to Dr. Julia Laskin on being selected for the 2007 Outstanding Mentor Award. This award recognizes U.S. Department of Energy Office of Science laboratory staff whose dedication and leadership have substantially contributed to the practical education of the country's future scientists. Laskin was selected because of her strong commitment to education. "Dr. Julia Laskin is an energetic and enthusiastic mentor," said Jeffrey Smith, who participated in the Science Undergraduate Laboratory Internship. "Because of her, I am getting invaluable hands-on experience about what cutting-edge research science is." In addition to her mentoring, Laskin is internationally recognized for her work on gas-phase ion chemistry and mass spectrometry of large complex molecules. 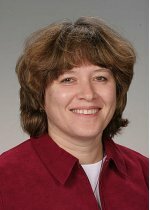 Her work is critical for developing analytical techniques to improve characterization of synthetic and natural polymers, petroleum, biofuels and other complex samples. Her research and numerous publications have earned her outstanding recognition within the scientific community, including the 2007 Presidential Early Career Award for Scientists and the Department of Energy's Office of Science Early Career Scientist and Engineer.